Do you find yourself mumbling "Double, double toil and trouble" when you cook a stew? Do you have an unusual fascination with frogs and earthworms? Do you wonder if it's possible to turn your neighbours into pigs? 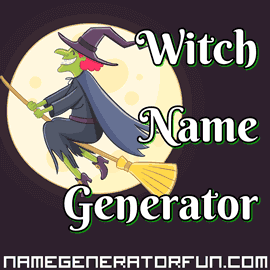 Then look no further and embrace your wicked destiny with our witch name generator! We aimed to have good, light-hearted fun with this generator. We particularly aimed it at kids who are looking for funny Halloween names, along with adults who want spooky, silly witch names for social media. We hope it raises a few giggles! Witchcraft and its practitioners have actually been around for almost all of recorded history. Witches are generally held to be different from sorcerers – instead of using some physical tools or actions to cast spells or create curses, their magic is usually seen as coming from some indefinable inner quality that they may even be unaware of. Different forms of belief in witchcraft can be found across a multitude of cultures, from India and Japan to Nigeria and the Caribbean, although the overall perception of witchcraft in the Western world comes firstly from the laws prohibiting it in the Old Testament, and then the use of belief in witchcraft by the Christian religion in the late Middle Ages. This change in the religion repositioned witchcraft as specifically associated with Devil worship, and the end result was a long and often painful history of violence and moral panics. One of the main accusations of witchcraft would involve the idea of the witch being able to influence the mind, body, or property of somebody else against their will (an idea that occurs as early as ancient civilisations like Babylon and Egypt), but witch hunts often broadened the definition of witchcraft to include anything that might even slightly be perceived as 'unnatural'. Necromancy (communicating with spirits, or raising the dead) was another regularly perceived aspect of witchcraft that gained a serious infamy during the Middle Ages, and fuelled the idea that Christianity was in a full-on war against the Devil who had made a secret pact with a whole army of witches. Now, however, centuries after the violence of the witch hunts, witchcraft has a very different reputation. The late Victorian interest in spirituality led to a revived interest in the idea of witchcraft in the early twentieth century, and an article written by anthropologist and archaeologist Gerald Gardner in his 1954 book Witchcraft Today is largely held to have sparked off what's known as Wicca, which has grown over the years to become the largest Witchcraft tradition in the Western world. This has also been helped by the increase in positive representations of witchcraft. There have always been the views that some witchcraft practitioners are 'white witches', who use magic purely for benevolent purposes, something that many modern neo-pagan witches strongly identify with. Also, while the media over the last century has carried many classical depictions of witchcraft – most notably The Wizard of Oz and its Wicked Witch of the West – there have also been works that put a greater emphasis on magic as empowerment, with TV series like Buffy the Vampire Slayer and J.K. Rowling's Harry Potter saga of novels. Witchcraft is a complex, ever-evolving idea that has been with us for generations, and shows no signs of losing the fascination it holds for us. If you enjoyed being a witch, you might also like our names for vampires, werewolves, or for something equally as silly, tough guys. Or you can check out the rest of the site via the menu above. Image Credit: Wicked witch designed by Freepik. Licensed under CC BY 3.0.